Our Doors Open Day 2015 was a massive success and thousands of people were welcomed by our participating buildings and spaces across the city. For the first time we had a dedicated childrens programme with over 45 different activities and events ranging from archaeology to arts and crafts and storytelling to sporting events. Our childrens fantastic brochure was designed by local artist Rosemary Cunningham and attracted plenty to the festival with more than 5,500 visits by children. One of our most popular events was The Mazing Memory Museum developed by City of Play and hosted by the Riverside Museum. 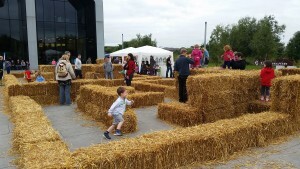 Here, visitors found a creative workshop within an exciting hay bale maze complete with creative and educational activities about Glasgows history as well as fun ways to share and record their own experience of the transport museum. We also encompassed some archaeological events into our Children’s Programme including the fantastic Provan Hall ‘Wee Dig’ where children could see some archaeology in action. With help from the RSPB, children learned about wild foraging and got the chance to both see and taste medieval-style bread cooked in an outdoor oven.. There was face painting, artefact displays, live music and demonstrations for a full-on family day out with plenty of activities to keep everyone busy. And if medieval history wasn’t your thing we also had a reconstructed World War I Allied and German trench systems set up at the Burrell Collection designed specifically for children. 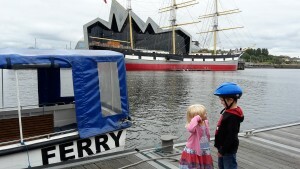 There was certainly plenty of children’s activities to choose from throughout the 2015 Glasgow Doors Open Day festival and we loved supporting the many fledging heritage enthusiasts in Glasgow. Activities gave children the chance to explore some of their local history, to be creative and to try lots of new and exciting things. As well as interactive events in a our historic buildings we also opened up fire stations, workshops and artist studios and even highlighted some of our fantastic green spaces here in Glasgow through family events in a number of community gardens across the city. Venues really got behind our new children’s events but two participants really stood out and were honoured as part of our Glasgow Doors Open Day Civic Reception. Proving just how popular our events were, we couldn’t pick just one but instead awarded a joint Children’s Educational Experience Award to Glasgow Sheriff Court and The Scottish Mask and Puppet Centre. 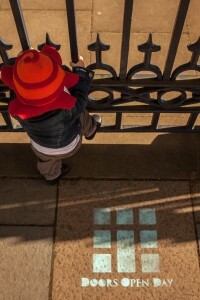 Both spaces, although very different, embraced the educational focus of Glasgow Doors Open Day and provided exceptional opportunities to learn about history, heritage and architecture. We’re looking forward to planning our 2016 Doors Open Day and providing another exciting and engaging Children’s Programme as part of our festival. If you have any suggestions for children’s event or on how we can make our programme even more family friendly please contact Rachel Holliman, GBPT Events and Development Coordinator rachel@gbpt.org.